No, none of my three cats has multiplied, they are all missing rather vital parts for that. The house across the street has been an ongoing issue for me since I moved here almost two years ago. 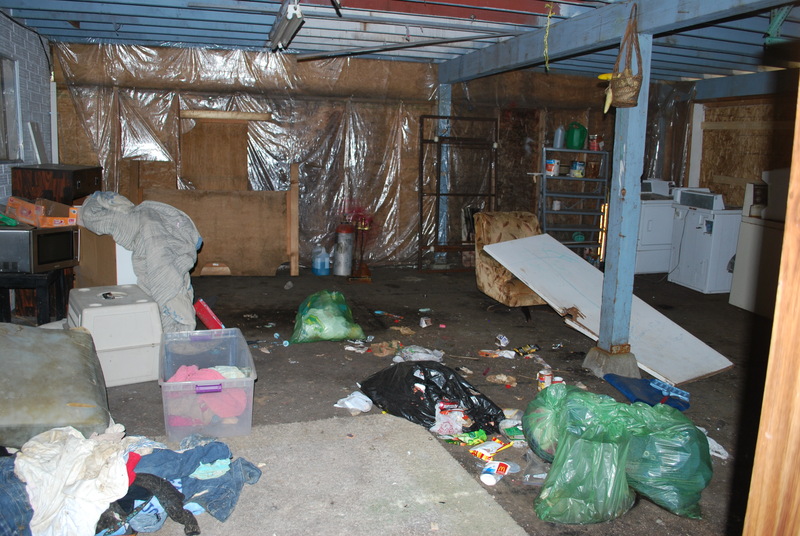 It’s a dilapidated rental property that was used for many months as a drug-dealing slash prostitution slash theft ring. Nice place for kids right? Yes, there were small kids living there during all this. People would come to buy their crack and crystal meth at all hours of the day and night, it was a constant inflow and outflow of people you don’t want around your property. It was like living across the street from a convenience store. After countless complaints to police and the city they finally moved out, leaving huge piles of rodent-infested trash everywhere. Then new tenants moved in. 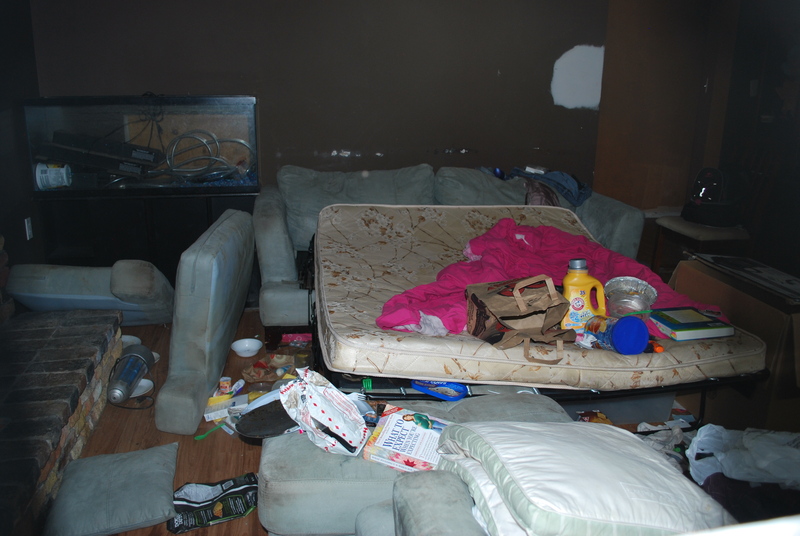 Well, the place was never cleaned up and these tenants are finally leaving as well. The whole house pongs of pet urine and is completely falling apart. A few months back the SPCA came and removed a bunch of emaciated dogs and neglected cats. Now it’s my turn. 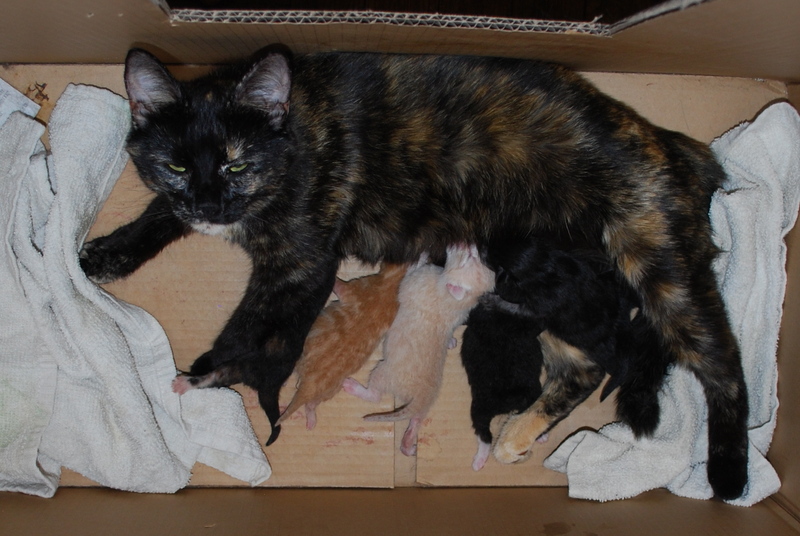 Since the vacating tenants could not care for them, I was asked to take in a mother cat and her five newborn kittens. Knowing the conditions they were living in I said yes without any questions asked. They are now safe and cozy in their own room with plenty of clean water, fresh food and a clean litter box. All the cats stink of urine, but are otherwise in decent health. I’m sure momma will clean the kittens up and she can have a bath at some point if she really needs one. Hopefully she’ll be able to clean herself up, I know she’d prefer that to being bathed. A clean environment will definitely help. So now we are a cat hotel. It’s been many years since I had a litter of kittens to care for and it will be very nice watching them grow up. The mother cat is very friendly and seems very happy and secure in her new location. One little boy kitten has no tail. I wonder how that happened momma? This entry was posted in cats and tagged abandoned kittens, fostering kittens, neglected cat and kittens, newborn kittens. Bookmark the permalink.